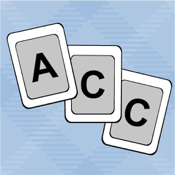 Algebra Card Clutter is a fast-paced math card game for improving mathematical intuition. Players experience 14 unique levels testing their knowledge of natural numbers, integers, fractions, decimals, square roots, and exponents. The goal of the game is to touch the cards from lowest to highest, as fast as possible. If you get a high score, you can enter your name in the leader boards for everyone else to see. The timer counts up to a time limit. If you exceed the time limit, you must restart the level. Incorrect guesses add a 30 second time penalty.